The college came into existence in 1961 under the committed and dynamic leadership of Dr. M.B Srivastava.What college offers to stake holders is a freedom to perform and grow. Department of Geology has fully seized this opportunity and created a strong presence for itself among the fellow departments existing in the length and breadth of the country. The forward march of the nascent undergraduate department was led by Dr. A.K. Roy and Shri B. K. Pandey and after a couple of years of service Dr. A. K. Roy left the Department and the entire responsibility was trusted on the shoulders of Dr. B.K. Pandey. Soon in 1965, the Department was upgraded into a post-graduate department and imperceptibly into a research centre. Like any other organizations, the initial decade was a sort of instability as far as the faculty is concerned despite a firm footing of the institution. A large number of faculty members left the Department for a better opportunity or for temperamental reasons yet few anchored themselves firmly with the destiny of the future giant. Among these notable are Dr. M.S. Anantharaman (1965) and Prof. J.D. Badhe (1967). Prof. C. Prasad and Prof. S.S. Srivastava stayed in the department for a longer duration. With the appointment of Dr. P.C. Bahukhandi (1974), Dr. M.N. Joshi (1976) and Dr. A.K. Biyani (1978) the instability came to an end. Barring the last name, all the others in course of time retired from the service time to time, but lured by the magnetic attraction they visit the department regularly and share the academic responsibilities without any expectations. The Next appointments were made in 2008; Dr. Deepak Kumar and Dr. S. Sinha partially filled the vacant slots. Though Dr. Sinha stayed for less than a year for family reasons but engraved an impression of his presence by notable research contributions. Faculty members have authored a good numbers of monographs; reference book and text books like Dimensions of Himalayan Geology, A Text Book of Paleontology, Magnesite- A Geological Study. Faculty members have carried out minor and major research projects funded by the UGC, DST, UCOST and BP Koirala Nepal- India Foundation. Research students and teachers have written nearly 200 research papers published in national and international journals. A reputed Indian science journal Current Science has published 13 correspondences of Dr. AK Biyani; Impressed with the research performance DST had identified the Department as beneficiary in its FIST scheme, an honour conferred for the first time to any college department.The Department also successfully managed to get post-graduate development grants from UGC. To widen the vision of current students and increase their interaction with leadership in different field, a society of teachers and students named Geofraternity was informally established in 1999. The formal launching of Geofraternity was done in 2002 by the then central Minister of Science and Technology Shri Bachi Singh ji Rawat. So far under the banner of the Geofraternity 85 lectures have been deliverd in the department for the benefits of the students. Geofraternity has organized two national level seminars in 2002 and 2005 and a large number of workshops. Besides these Geofraternity conducts lecture series, debates and essay competitions, celebrates science day, group discussions and social service. Succesful existence for the past thirteen years in itself speaks about the usefulness of the Geofraternity. Activities of the Geofraternity are very responsibly maintained by the students. A saved contribution is used for up gradation of facilities in the department. High level dignitaries like governors, chief ministers, and central ministers have graced the functions of the Geofraternity. Geofraternity encourages the students for participation in national/ international competitions. 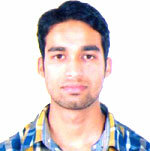 Its student members have brought laurels to the college by winning the competition. In achieving the all round high standards, the role of supporting staff is very vital. Shri Nagina Ram, Shri Rambachan and Shri Dharamveer Prasad, all now retired, served the department for decades with an exemplary dedication. Qualification M.Tech., M.Phil & D. Phil. Qualification M.Sc., CSIR - NET, Ph.D.